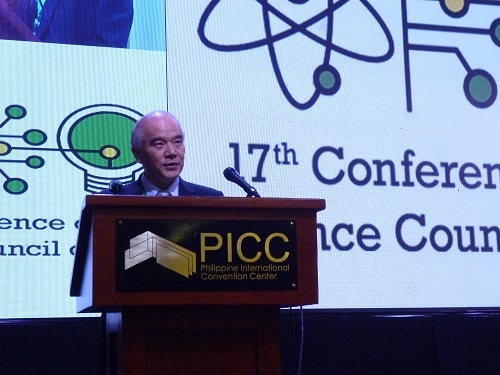 The 17th SCA Conference was held between 14 and 16 June 2017, at Philippine International Convention Center in Manila, the Philippines. The 17th SCA Conference included an International Symposium consisting of an opening ceremony, 6 Plenary Sessions, 4 Parallel Sessions, each with 6 to 9 oral presentations, 2 poster sessions with approximately 160 posters, a closing ceremony, SCA’s Management Board Meeting I and II , and Joint Project Workshops (JPWS). The Conference was attended by around 13 countries/regions with around 450 participants. At SCA’s Management Board Meeting, the17th SCA Conference Declaration was adopted after the deliberate discussion. Furthermore, the new officers were introduced and it was also agreed that the 18th SCA Conference continues to be presided over by President of Bangladesh Academy of Sciences, but the venue is adjusted to be held in Japan as exceptional measures. Science, Technology and Innovation (STI) are recognized as crucial drivers of economic development and improved national competitiveness. Recently, the United Nations Sustainable Development Goals have emphasized that effective partnerships supporting inclusive development needs to frame the concept of no one left behind as the overall goal. Such partnerships necessitate a rebalance of priorities and concerns to achieve a paradigm shift which involves novel thinking that is supported by effective evidence-based policies and instruments that will provide a solid roadmap for action. 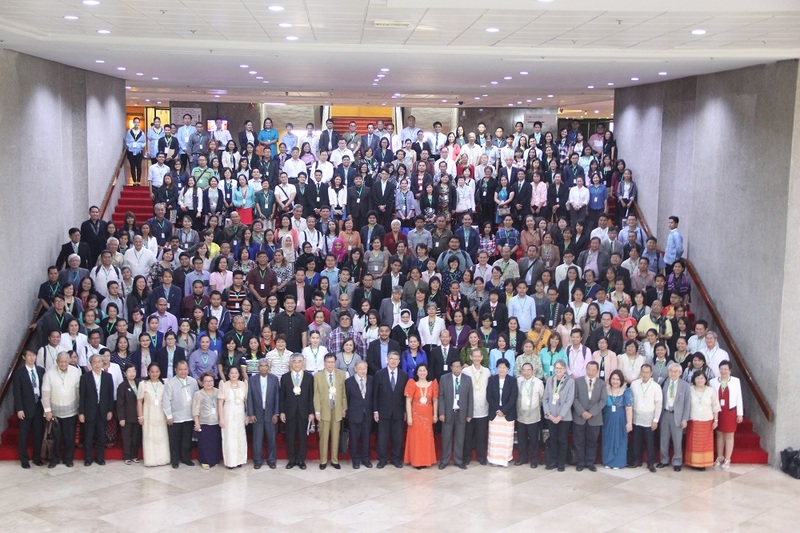 SCA has been working to strengthen the cooperation between scientists and facilitate interactions with policymakers in keeping with its role of providing a multi-functional platform of networking for effective partnerships among the countries in Asia. Approximately 455 scientists from around 13 countries/regions who participated in this 17th SCA Conference had intensive discussions on how STI could be best utilized for inclusive development. SCA will help pursue multi-stakeholder collaboration to ensure well functioning STI ecosystems in the region. In order to utilize fully the potential of STI, multi-stakeholder undertakings that integrate knowledge in science and technology into the educational and socio-political agenda through the involvement of educators, social scientists, policymakers, civil society and other stakeholders including international organizations are deemed crucial, as was highlighted in the presentations of the Conference. It is important that STI be integrated into public policy goals, giving particular focus to the nexus between STI, culture, education and development. STI will need to be made more participatory and inclusive so that there is public engagement in the scientific endeavor from the full spectrum of social actors, including women, young people and indigenous communities. SCA will facilitate implementation of research partnerships for inclusive development and will work towards strengthening participation of its members in internationally important programs. In order to achieve and sustain inclusive development in Asia utilizing STI, scientists in the region, who belong to diverse local communities, should work towards building research partnerships in various fronts. STI partnerships play a critical role in the creation and dissemination of technologies in sectors of public importance, especially human health, agriculture and the environment. Although applications of STI to local communities differ within the Asian region, strong cooperation is necessary for the propagation of the best practices within the region. In keeping with its objectives, SCA is expected to fully support the conduct of joint projects among member organizations and scientists from the region. A discussion on the Philippines’ perspective on Future Earth demonstrates how the country can strengthen its participation in the program, as exemplified by the transdiciplinary systems research on air pollution. 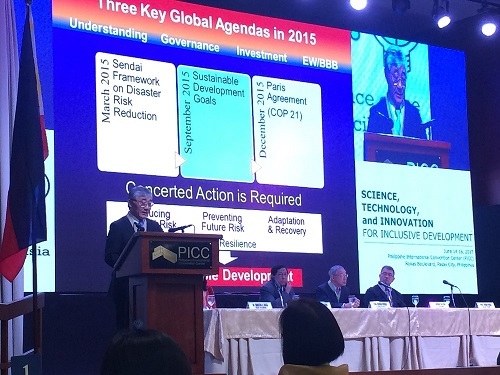 Scientists in the region must work collaboratively at achieving a sustainable future for Asia as well as for the world. Thus, intensifying participation in international programs such as Future Earth is deemed imperative. SCA will promote utilization of research and innovations for humane and sustainable development. There is a need for cooperation between sciences and the arts toward humane development especially in these times of crises spawned by global indifference to the intersection between the environment, economic growth, health and other aspects of well being. Transdisciplinary scientific and creative research should inspire scientists to find more meaning in their research and produce outputs and innovations that are geared towards humane development. Research needs to be solution-oriented and address significant problems faced by people in Asia and other parts of the world. Natural and physical scientists need to collaborate with social scientists and humanists to facilitate the effective communication of scientific knowledge to affected populations. A quadruple helix model for innovation and sustainable development has been suggested, characterized by synergy among four components: government, industry, academe, civil society and human welfare, to ensure that research outputs and innovations are utilized for sustainable development. SCA will support actions and policies to enhance resiliency towards natural disasters and address the effects of climate change. The 17th SCA Conference draws attention to the various issues related to climate change, such as its impacts, resilience and adaptation strategies. Moreover, studies addressing disaster risk reduction of natural disasters caused by climate change, earthquakes and tsunami were presented. SCA resolves to encourage its members and the countries of Asia to take action and adopt policies, which can help address the effects of climate change and make our society more resilient to natural disasters. SCA will further deepen its involvement in national and international undertakings to address climate change and disaster risk reduction issues. SCA will commit to actions and policies that support gender equality and empowerment of young scientists in the region. It is noteworthy that a significant number of young scientists and women scientists from Asia participated in this conference, where sessions on gender integration and mainstreaming were highlighted. To ensure Asia’s sustainable and inclusive development, SCA should urge its members to promote gender equality in the manner in which they conduct their work and by committing to gender mainstreaming and integration. Promoting the involvement of women scientists and prioritizing the nurturing of young scientists in the region are deemed crucial. SCA will promote strict adherence to ethical standards and integrity in the conduct of research. Sessions during the 17th SCA Conference emphasized the importance of adhering to ethical norms in the conduct of research. These norms promote truth, beneficence and social justice. Members of the SCA are encouraged to do collaborative research, which involves cooperation and coordination among many different people in different disciplines and institutions. Thus, adherence to ethical standards is of utmost importance in order promote values that are essential to collaborative work such as trust, accountability, mutual respect and fairness.